I'm currently crushing on chain heavy jewelry and can't wait to get my hands on a few pieces to add to my collection of bling. Either classic gold or edgy mixed metal, chain link necklaces and bracelets instantly take a classic white tee and jeans to a fashion forward level. Now you know what I'll be shopping for this weekend. What about you. And don'f forget, the Nordstrom Anniversary Sale starts today!!! Ok so at first I wasn't a huge fan of this look, but the more I see different ways to style it the more it grows on me. I instantly loved this trend so much! In this case I love #10 because of the different colors and textures going on. I totally can see this going sweet or edgy. Love this as well! I love them all but if I was forced to only pick 3 then they would be #3, #4 and #10. Can't wait to see what you find while shopping! This is such a great trend! I especially love the Marie Chavez necklace. 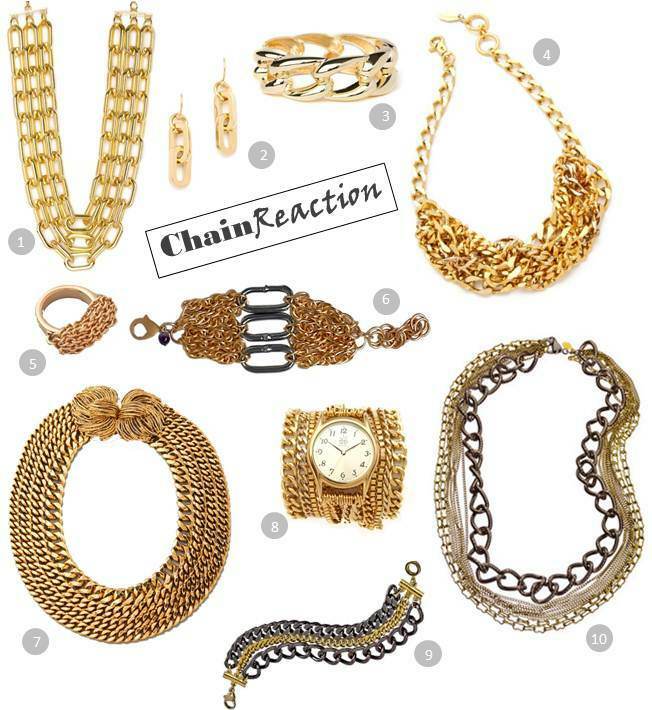 Chain heavy jewelry is so useful - it can instantly make a boring outfit interesting! Great post! Love the mixed metal looks (#9 & 10)! Loving all of these!! I don't even know if I can pick a favorite...they are all fabulous! I am drooling over every single piece right now! I agree completely that they take your outfit to the next level. Love the third one, so nice !!! OMG! These are so cool and I want all of them :). Love these pieces chelsea..I've been into the chain thing for awhile now! Really love the chains! Great selection for once again! and your blog is gorgeous, darl! i found you on one of my followers sites. I am following you now, I hope you can follow me too, if you like my blog, as I would like to stay connected with your blog. Oh my,I love every piece...thanks for stopping by my blog..